UTILITY: PU Leather handbags,Satchels，Shoulder Bag Purse,Tote, Crossbody bag ,Messenger Bags.Suitable for you to carry it when shopping, dating, working, traveling and so on. DIMENSIONS: 11.8"L x 5.1"W x 7.9"H.Suitable for you to carry it in daily-use, such as shopping. dating, working, traveling and so on. INTERNAL:7 Pockets(2* Main Compartments,1* Back Zipper Pocket,2* Interior Zipper Pocket,2 Interior Open Pockets for keys/card.) Comfortably holds an lipstick ,Mirror,iPad ,iPad Mini,Iphone8, umbrella, books and so on. Please pay more attention to the size reference on the image. 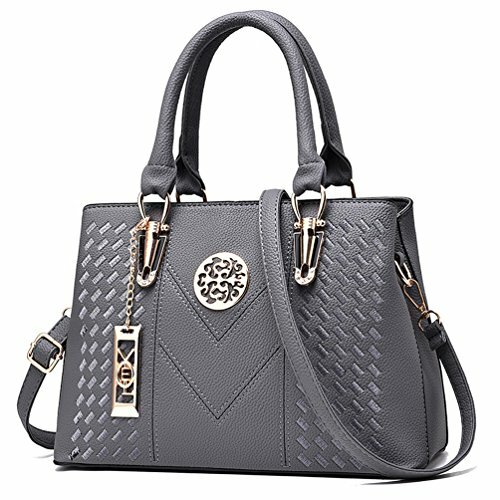 FEATURES: Come with a long removable shoulder strap and unique ornaments,Show elegant lady charm. If you have any questions about this product by ALARION, contact us by completing and submitting the form below. If you are looking for a specif part number, please include it with your message.